The parade of spiced lattes, pumpkin pies and pancakes is almost here. 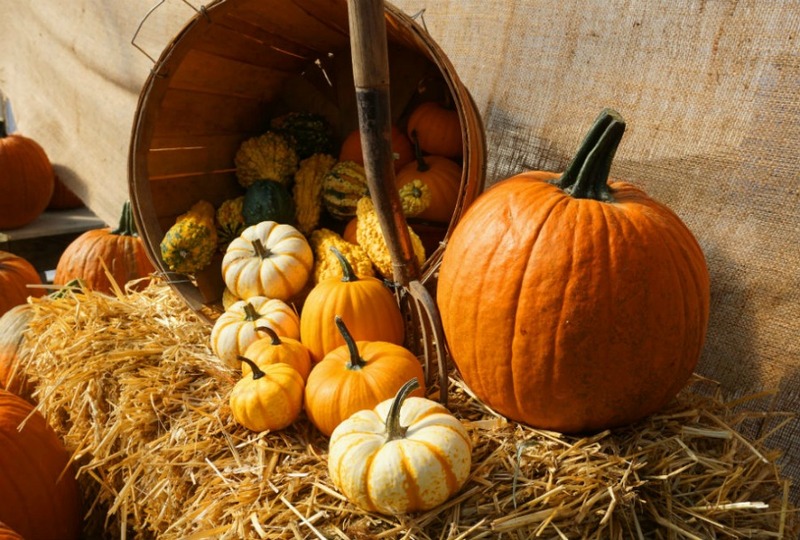 Pumpkin festivals and roadside pumpkin stalls will soon be here and pumpkin patches will become once more great family destinations. Fall is all about carving and decorating pumpkins and getting ready for the month of October. There is a wide range of creative pumpkin decorating ideas, such as spider webs, glittered pumpkins and glow in the dark pumpkins. Most people are in love with fall and with the idea of orange, green, white, smooth or warty and bumpy pumpkins. Fall inspires most of us to become creative and to make stunning pumpkin faces. It is great to find inspirational ways to decorate pumpkins for the coming fall season. Small pumpkins painted in black and white, for example, look stunning as a centerpiece on a table. Old nail polish will give a wonderful marble finish and tossing paint onto a pumpkin creates a unique design. If you have black chalkboard paint left in a container somewhere, you can use it to paint a pumpkin and let your child decorate it with white chalk drawings. 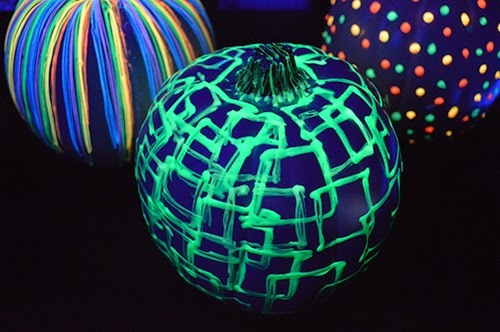 Children love glow in the dark pumpkins and it will look stunning at your front door. Glow in the dark paint can be purchased at your nearest hardware store. Two or three coats are usually needed to achieve the ideal level of brightness. Phosphorescent powder is available in quite a few colors. Dark powder can be purchased at art shops. Mix clear paint, dark powder and phosphorescent powder in a small bowl and paint the pumpkin. Larger particles in the phosphorescent will provide a more powerful glow. How fun! 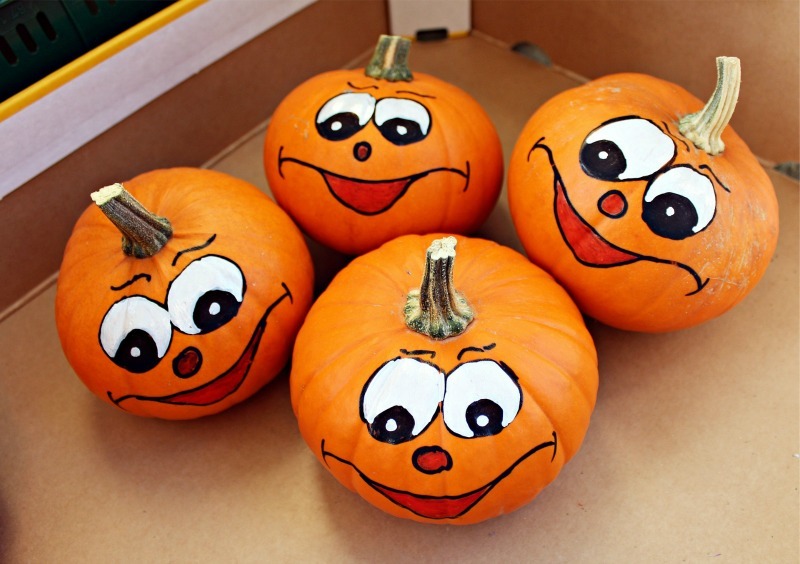 See how to paint your own pumpkins just like in the image above, here. Pumpkins painted in white are perfect for the month of October. Writing your own message such as welcome or smile in black on the white painted pumpkin creates a beautiful decoration. The contrasts of the two paints are stunning. Black paint looks good on a pumpkin without gloss or shines. Glue white flowers in the shape of a crescent onto the pumpkin and display it by the front door. It is amazing how good it looks. Pumpkins do not always have to look creepy or spooky. With some pom-poms, glue and spray paint you can create a colorful and fun pumpkin this year in October. 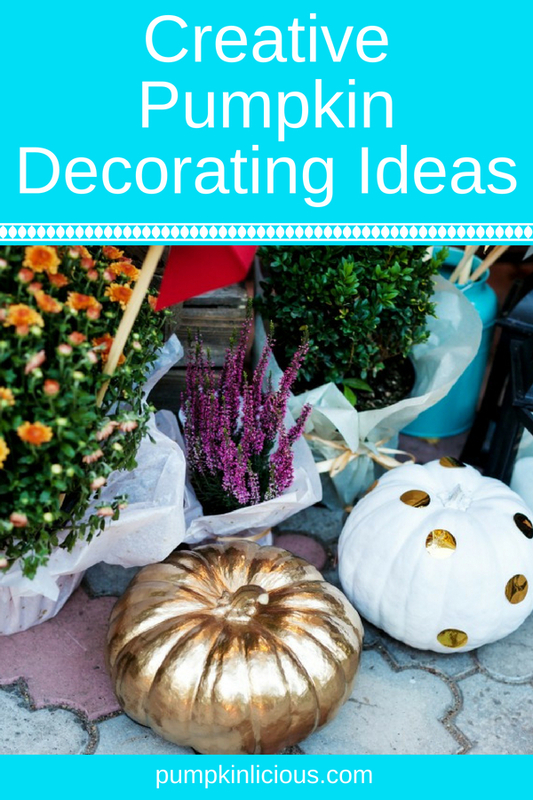 Spray-paint the pumpkin with a color of your choice and glue the pom-poms onto it. For a great fall ambiance, you can use large white pumpkins for candle holders and wrap grapevine garland or faux fall foliage around the pumpkin. A visit to the pumpkin patch is something most people look forward to. It is exciting to choose between the giant pumpkins, the skinny and tall pumpkins. Even when you’re still trying to find the perfect pumpkin, you already plan where you would like to put it. 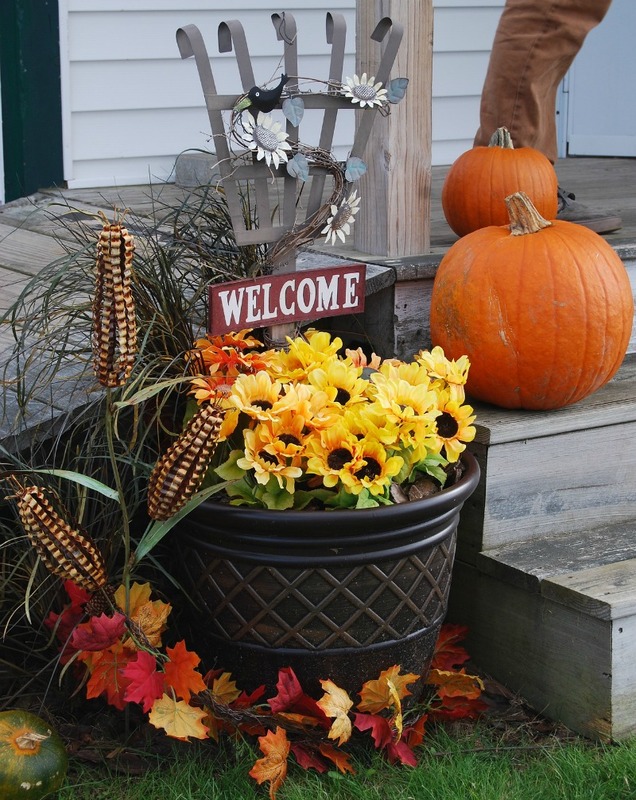 A great place to begin your display of the season can be your front porch. Paint four or five pumpkins of different sizes white and use black bat stickers to decorate it. Display the pumpkins in a way that makes the bottom step to have the largest bats and the top step to have the pumpkins with the smaller bats. For an easy porch statement, you can paint four pumpkins in different colors, such as gold, purple, red and pink. This is a quick decoration to make and looks amazing no matter where you display it. You can create a giant strawberry by gluing dark seeds on the outside of a red painted pumpkin. If you have glue and black glitter, you can create a black-glittered pumpkin by brushing the glue on the pumpkin and sprinkle the glitter onto it. Use black pipe cleaners, white and black paint and a stencil of a cat image. Paint the pumpkin white and once it is dry, paint a black cat onto the white pumpkin by using the stencil. A sponge will do a good job. Make whiskers with the black pipe cleaners. A taller pumpkin will be perfect to create the cat. 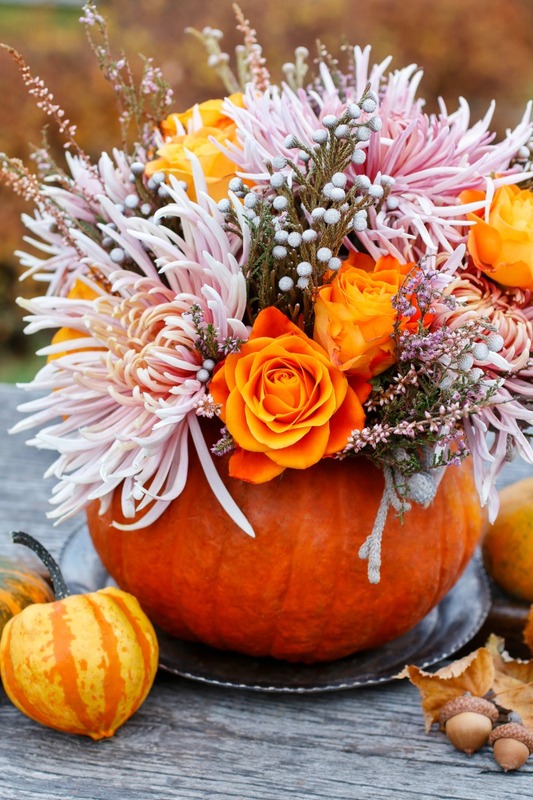 Create a beautiful floral pumpkin centerpiece for any occasion: great for your thanksgiving dinner too! Or, if you need a simpler idea, you can use tiny pumpkins to make a tea-light holder, set a small pumpkin on a plate and surround by autumn foliage, or simply create your centerpiece form a bowl full of small pumpkins. 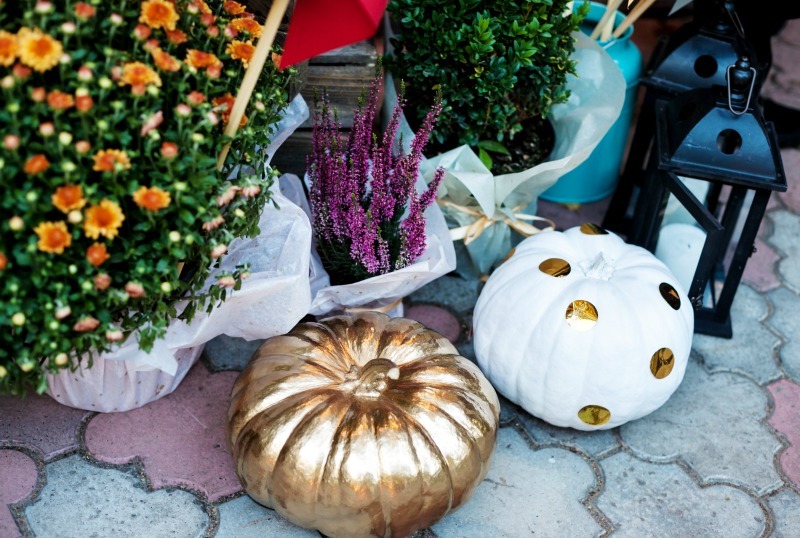 Creating a pumpkin centerpiece for your table doesn’t have to take forever. Here’s another idea you can make in about twenty-five minutes. You will need black spray, two twigs, wild flowers and smaller twigs with leaves. Use the two twigs a base with the ends going upwards. Add the flowers and smaller twigs to decorate it. Once you are happy with it, secure it with string. Place the centerpiece on top of a paper and spray it black. When it is dry, the centerpiece is ready to be placed on the table. Black lace is a stunning way to decorate small white pumpkins. Decoupage black lace with Mod Podge on the pumpkins and place it in the center of your table. Small pumpkins painted in black and white can also be used as a centerpiece. Fall is about spiced lattes, pumpkin pies, pancakes and creative pumpkin decorating ideas. A visit to the pumpkin patch in October is something most people look forward to. Pumpkins do not always have to look scary. To enhance the fall ambiance, you can find amazing ways to decorate your pumpkins without spending too much money. Please stop by our Facebook page and share pictures of your own creative pumpkin decorating ideas.